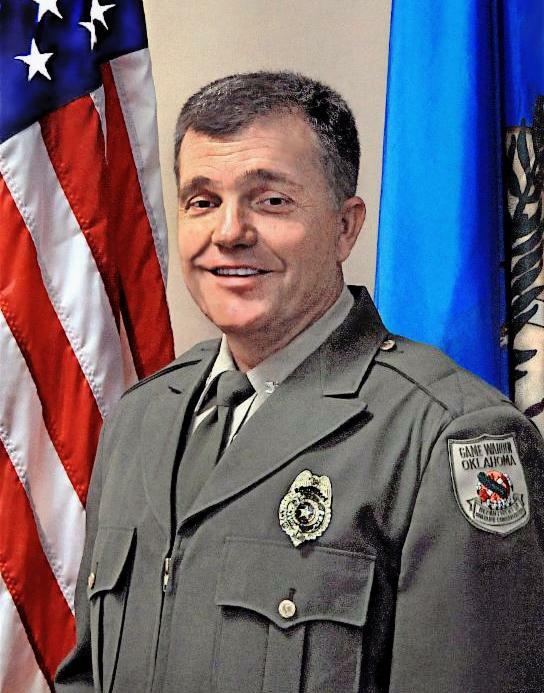 Former Assistant Chief Bill Hale has been named chief of the Law Enforcement Division for the Oklahoma Department of Wildlife Conservation. He began his new duties July 1, after the retirement of former Chief Robert Fleenor. The Department's Law Enforcement Division is responsible for upholding the laws and regulations that protect Oklahoma's wildlife resources.The chief of law enforcement oversees the division, the largest of the Department's five divisions with a workforce of about 120. The Division consists of game wardens, game warden supervisors and eight district chiefs. Central office staff includes the chief and assistant chief, a training coordinator and a secretary. Col. Hale, 52, has worked 27 years for the Wildlife Department, all in the Law Enforcement Division. He began as a game warden based in Comanche County, and in 1991 he was assigned to Stephens County. In 2010, Hale was named assistant chief and began working atWildlife Department headquarters in Oklahoma City. "I spent a lot of time in the chief's office, but I never expected that I would ever be chief," he quipped. Hale said game wardens are usually working on their own in rural areas of the state. "We have a bunch of self-motivated, self-driven game wardens. I've become very attached to them," Hale said. "These men and women are very good at doing their jobs." Game wardens are among the most recognized members of the wildlife conservation team in Oklahoma. The fish and wildlife laws they enforce ensure the continued opportunity for all sportsmen to experience hunting and fishing for years to come. Game wardens are public servants sworn to protect wildlife and the public's interests in the outdoors. These certified peace officers have statewide jurisdiction to act on any law violation. Game wardens have many duties that bring them in daily contact with people. In addition to enforcing the game laws of the state, they often spend time visiting landowners in their county, encouraging them to allow ethical hunters and anglers on their land to harvest the surplus wildlife. They may assist the landowner with poaching problems or give them information about getting fish for a pond. Game wardens check licenses and bag limits of hunters and anglers. To catch poachers, wardens may have to wait, day or night, for long periods in concealed locations. Game wardens must do their job well. They are constantly in the public eye. They are expected to know all there is to know about hunting, fishing, wildlife laws, wildlife management, camping and other outdoor activities as well as general information about their county. Hale, 52, grew up in Buffalo and later graduated from Hinton High School. He earned a business administration degree at Southwestern Oklahoma State University in Weatherford. He and his wife, Audra, have been married since 1984. Their son, Chisholm Hale, has served as a police officer in Duncan for seven years.